​​​one bucket at a time. ​​​but only half a harvest. ​​​and where does the rainy season go in dry? ​​​our tribe’s chief —the tree is a riddle. the wholeness of this place? DONNA BAIER STEIN’s chapbook Sometimes You Sense the Difference was published by Finishing Line Press. Her work has appeared in Prairie Schooner, Virginia Quarterly Review, Puerto del Sol, Beloit Poetry Journal, Poet Lore, and elsewhere. She was a founding poetry editor at Bellevue Literary Review and now publishes Tiferet Journal. Her story collection Sympathetic People was published by Serving House Books in 2013; it was a Finalist in the Iowa Fiction Awards; her unpublished novel Fortune received the PEN/New England Discovery Award. Other awards include a scholarship from Bread Loaf, fellowships from Johns Hopkins University and the New Jersey Council for the Arts, prizes from the Poetry Societies of Virginia and New Hampshire, an Honorable Mention from the Allen E. Ginsberg Poetry Prizes, a Summer Literary Seminars Scholarship, three Pushcart nominations and prizes from Kansas Quarterly, Florida Review, and elsewhere. 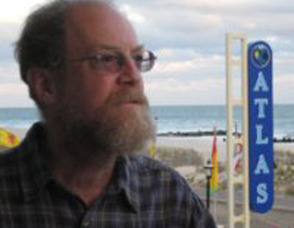 Tom Plante was born in New York City in 1949 and raised in East Rockaway. He studied Geography at the University of California in Berkeley and worked for several newspapers, including The Berkeley Barb, The Irish Echo, and The Courier News. He published Berkeley Works magazine (1981-85) and has published Exit 13 Magazine, an annual poetry journal, since 1988. Tom works in Elizabeth for the Union County Bureau of Housing and lives with his wife and daughter in Fanwood, New Jersey. John wants to put a metal frame around our house as a way of correcting its lean. He already put metal beams under the floor in the first-floor kitchen in an attempt to reverse its sagging. He points out how the straight edge of the new built-in bookcase in the first-floor living room calls attention to the ceiling slant. The space between wall and frame of the back door changes from 2 ¾ inches at the base to 4 ¼ inches at the top. The second floor has its own set of problems: Much carpentry had to be done to the kitchen window to square it on the wall and objects that fall on the dining room floor roll from north to south. This morning he, while sitting in the yard, noticed how the stairs are off-center from the door. Yes, I say to him, all over there are signs of the leans, slants, settles, sags and cracks underneath. But, I add, this house has survived a century; it does not need to be straightened out.